At this point, it seems safe to call Game of Thrones a phenomenon. It's watched by everyone from that guy next to you on the subway to the President of the United States, (Obama's favorite character is Tyrion, in case you were wondering), and the Queen of England. It's downright beloved. The series has received 83 Emmy Award nominations and set a record for the most wins in a single year. It nearly caused all of New York City to shut down when an ad featuring the presumably dead Jon Snow went up in Times Square a few weeks ago. With such a gigantic global presence, it's worth wondering how many Golden Globes Game Of Thrones has won — I mean, it would be logical to assume that the show has gotten its due at the Golden Globes too, right? Wrong, actually. GoT has been nominated for only three Globes and has won a lone award. 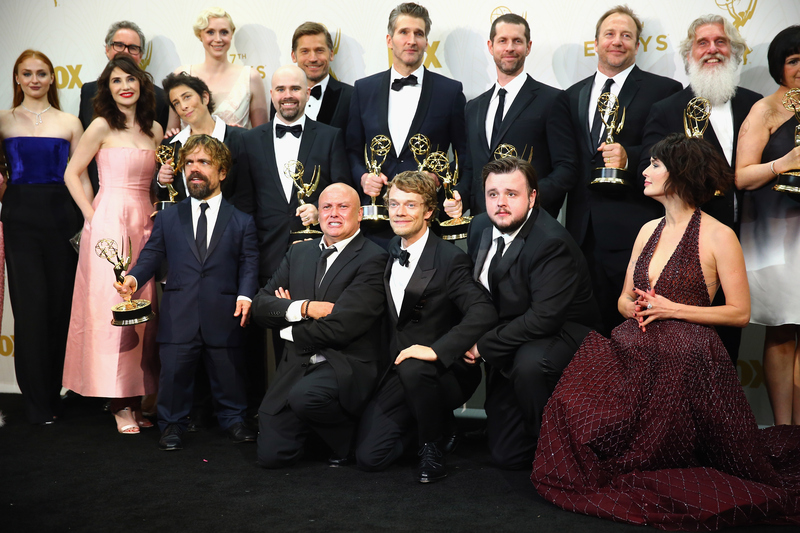 Series star Peter Dinklage was awarded as a supporting actor in 2012, meaning he holds the show's only Golden Globe. It was nominated for best drama series in 2011 and 2015, but it's yet to really break through at the Globes. With a particularly compelling season behind it, will the 2016 awards be kinder to the fantasy hit? I mean, with Jon Snow's untimely death (Jk. He's not dead. He'll live forever), no season of the show has been more talked about. With 12 Emmy wins in 2015 alone, GoT seems like it's in a good position as the Golden Globes near. It seemed like the entire cast had a least one intense, award-worthy scene last season, from Margaery's imprisonment to Arya's time in the House of Black and White. In typical GoT fashion, no character had an easy time. With the quality of acting and the number of actors on this show, there's no justifiable reason that GoT shouldn't be represented in all four acting categories. However, that wasn't the case — Game of Thrones was only nominated in the main Best Television Series — Drama category. Though this is disappointing, it's no surprise — the Globes love to shine a light on less-hyped, critical darlings like The Affair over big shows like GoT. It's totally valid to do so, but GoT deserves to be considered for once. Three nominations in five seasons is ridiculous. It's time the Golden Globes took some notice of the great work this show is producing. Here's a few reasons why GoT should win the Golden Globe this year. This season, viewers got to see another side to Cersei, and Headey really killed it. She's part of what makes the show great year after year, and she deserves a nomination. GoT is fantastic every season. Some shows start out strong and then slowly get worse, but this isn't one of them. Even when they deviate from the books, the writers find a way to make the show even better. Unlike most shows, GoT is in production in multiple countries at one time. They film all over Europe simultaneously — hardly any other show on television pulls that off. It's truly amazing, and it adds so much authenticity to the world of Westeros. In addition to being one of the biggest productions on TV, GoT also has the biggest cast. Every season features more and more people. That's part of what makes it so great to watch — it's always evolving. GoT features amazing performances by women. Even characters who seemed weak at first, like Sansa or Margaery, have become dynamic and strong. And the women who were badasses from the beginning have gotten even cooler, (looking at you Arya). Although GoT is a fantasy series, it's recognized by fans and critics alike as great television. So often, movies and shows that aren't rooted in reality are neglected by awards shows. GoT finally got its due at the Emmys. It's time the Golden Globes recognize it too.